One-in-a-lifetime occasions like a bat mitzvah or bar mitzvah require that special touch. A custom bat mitzvah postage stamp or a personalized bar mitzvah stamp are just that extra touches for a memorable bat or bar mitzvah invitation. It's easy to creat a personalized stamp. Click any stamp to discover your options. Printed in Partnership With Zazzle. Complete Satisfaction Guaranteed. See the Zazzle Promise. A simple yet striking Bar Mitzvah stamp. Black background with golden Star of David and "Bar Mitzvah" in white font at the top. Whimsical personalized "Club Bar Mitzvah" stamp with a silhouette of a cheering crowd at the bottom and Star of David in the center. Simple and elegant Bar Mitzvah stamp with a colorful tree of life against a blue sky. Could also be used for Bat Mitzvahs as there is no text. The clear font on this clever Bar Mitzvah stamp puts your son's photograph behind the text "Bar Mitzvah". Truly unique. Many foreground colors to choose from. 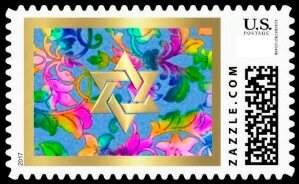 A colorful rainbow of Stars of David, this stamp is suitable for Bar Mitzvahs or Bat Mitzvahs. A stylish Bar Mitzvah stamp with a gray stone Star of David in the upper right corner and your young man's name above the text "Bar Mitzvah". Strong blue background. Text can be easily changed for "Bat Mitzvah". A green and blue distressed stripe pattern in the background with a silver Star of David. All text is easily customized for use as a Bat Mitzvah or Bar Mitzvah stamp. Matching invitations. Rich and beautiful Star of David in blues, this Mitzvah postage stamp celebrates Judaic art and values. Coordinating cards also available. Colorful and swirly tree of life fills the left side of this Bar Mitzvah stamp. Gold and flowing script. Easily replace "Sample font" with your son's name or other text. 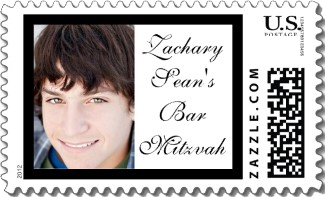 Completely personalize this fun Bar Mitzvah stamp with your son's close in photo and name. Available in a variety of frame colors. 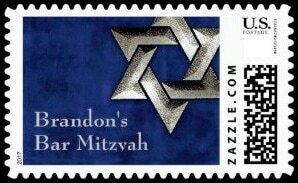 A striking Bar Mitzvah stamp with a mottled blue background and "Bar Mitzvah" in a tan script font. Fast Printing and Shipping provided by Zazzle. Learn More About Our Fast Turnaround. A fresh and vibrant Bat Mitzvah stamp with your daughter's portrait and your custom text within a yellow border. Colorful Bat Mitzvah invitation postage stamp with Bat Mitzvah in decorative scroll gold font against a mottled purple background. The clear font on this clever Bat Mitzvah stamp puts your daughter's photograph behind the text "Bat Mitzvah". Truly unique. Many foreground colors to choose from. Colorful Bat Mitzvah invitation postage with pink, purple and white and Bat Mitzvah in fancy scroll font. Easily add your daughter's name. A swirly, floral and colorful image of the tree of life fills the frame of this girly Bat Mitzvah stamp. Soft cream white damask background and shiney pearlized Star of David are the highlights of this Bat Mitzvah stamp. All text is easily customized. 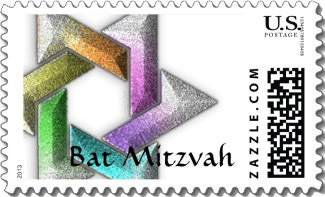 A colorful Star of David in granite fills most of the window of this Bat Mitzvah postage stamp. "Bat Mitzvah" in a black font overlaps the Star and the white background. Delightful Bat Mitzvah stamp with swirling colorful florals against a sky blue background and a gold Star of David. This festive and modern Bat Mitzvah stamp in pink, purple and greens. Coordinating invitations also available. 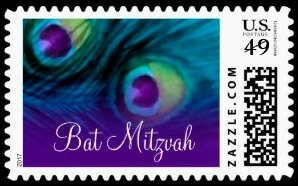 A feminine and girly Bat Mitzvah postage stamp of purple and teal peacock feathers and the text "Bat Mitzvah" in a script font near the bottom. A sophisticated Bat Mitzvah stamp with black polka dot pattern with a hot pink ribbon illustration. Easily include your daughter's name. 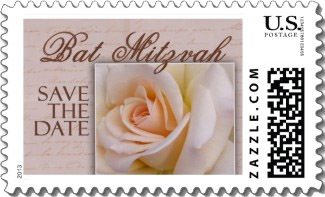 Pink ribbon and black lacy damask against a silver background with the text "Bat Mitzvah" Elegant Bat Mitzvah postage. Soaring dove Bat Mitzvah postage stamp. Brown background with yellow and pink streamers following the bird of peace. Easily add your daughter's name. Colorful Judaica vintage tapestry Hamsa Bat Mitzvah stamp. Captivating. Multi-colored and stylized Star of David with decorative design of pink, blue and cream. Your daughter's name in the center. A compelling Bat Mitzvah stamp. 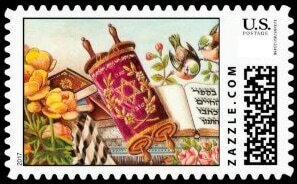 A festive Bat Mitzvah stamp with colorful vintage images of a Torah, yellow flowers and songbirds. The Star of David in lights against a purple background catch your attention on this Bat Mitzvah stamp. Easily substitute your daughter's name. If you don't love it Zazzle will take it back. See the Zazzle Promise. A custom bat mitzvah postage stamp or a personalized stamp with your son's or daughter's photo are just that extra touch for a memorable bat or bar mitzvah invitation. It's easy to create a personalized stamp. Click through any customized stamp to discover the text and photo upload windows.